On the tenth International Primate Day, September 1st, Animal Defenders International (ADI) is calling on legislators to prohibit the capture of wild primates, and take measures to end their use in entertainment, research and as pets, stating that governments must do more to help primates in peril both in the wild and captivity. 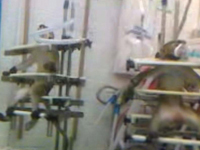 ADI has exposed the suffering of primates around the world for over 20 years, documenting hellish conditions for primates at attractions like ‘Monkey School’ in South Korea, chimpanzees riding bicycles in a show in Germany, and exposing the suffering of monkeys used for crude and outdated experiments. 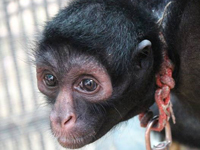 One spider monkey rescued by ADI, Annie (pictured), has become the face of a public awareness campaign in Peru. “Your house is not my home” encourages people not to keep primates as pets.